Boost your content reach with influencers, and access highly engaged audiences ready to consume and share your digital content. From case studies to blog posts, Instagram photos to viral videos, content has become one of the most effective way to capture attention and drive engagement. It leads to improved brand awareness, more enthusiastic fans, higher sales, increased downloads, return visitors and much more. So whether you are an advertiser or a musician, an author or a photographer, content is one of the most important ways to engage audiences and has become essential to a brand’s success. Of course creating unique and powerful content is just step one. The big challenge is distribution and ensuring your targets see the content you’ve poured your heart and soul into. Influencers represent some of the most trusted voices in today’s digital environment. So it’s not surprising, they have proven to be a huge force in promoting and delivering your content to the people that will find it valuable. They have both the reach, and the reputation—which means results. But impact potential goes well beyond follower count. Sure celebrities and athletes attract attention, but so do niche bloggers, friends, community leaders and more. Their voices are powerful and too often untapped, especially when it comes to subject matters such as beauty, fashion, health, food, home improvement and technology. These are the voices you want amplifying your message. The ambassadors who can take your content, and share it with the masses. Snips Social Stories is the first automated marketplace that connects content creators and influencers at scale with the purpose of simply sharing awesome content. 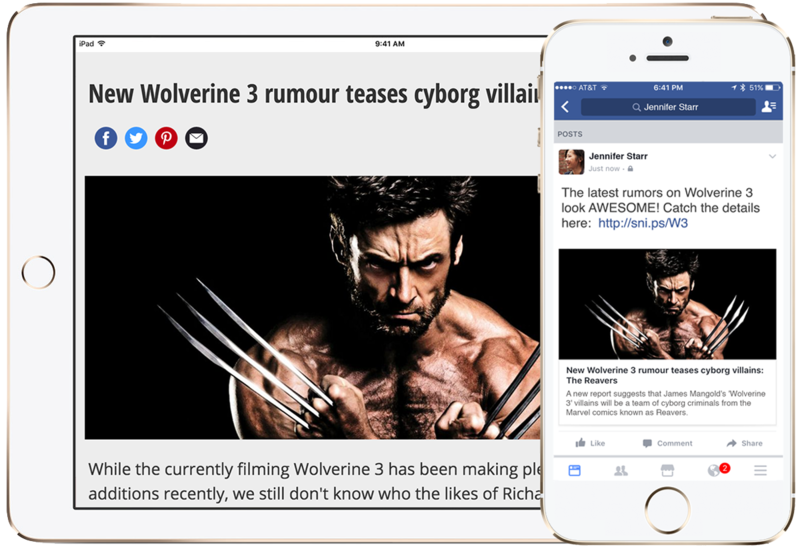 It builds on our super popular Snips Social Buzz offering that re-invented the concept of sponsored posts, but is uniquely designed for content publishers who simply want readers to view, read, love, share and react. Publishers, artists, videographers or really any content creator, can easily promote their shareable content, while influencers build buzz by adding their own voice to the post. The result: significantly higher audience views and engagement. To maintain accountability, Social Stories operates on a performance-based cost-per-click (CPC) model. That simply means influencers earn based on their ability to drive quantifiable consumer engagement, and content creators only pay for measurable results. We empower content publishers and influencers alike through transparency, access to the right tools to track campaign performance, and giving the power to choose what to share and where to share it. No other platform provides the automation, flexibility, and scalability of Snips Social Stories. Social Stories campaigns allow influencers to promote blogs, articles, news, video and other content across any social media or online platform. Influencers snip and share the link to the Social Stories campaign, adding their own message or voice to the post. When followers click on the snipped link, they are taken directly to the content page. What content can I promote with Social Stories campaigns? Any organic non-branded content, such as blogs, articles, news, and videos. How is Social Stories different than native social media ads? Social Stories is a universal advertising platform which can be posted to any social media, like Facebook, Twitter, LinkedIn, or Pinterest. It appears as native content in your profile, with the addition of your own voice added to the post. While most social media advertisements operate on an impression model with no garauntee of engagements, Social Stories operates entirely on a performance-based cost-per-click (CPC) model, so you only pay for real results. Social Stories campaigns automatically count unique visitors per 30 days. You can additionally limit your campaigns to specific countries.